This Nutella cake recipe is every Nutella lover’s dream cake! 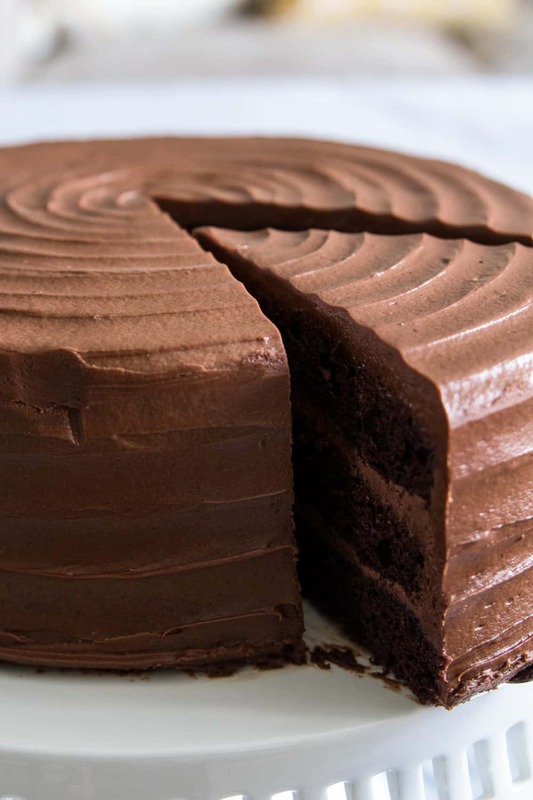 Layers of moist chocolate cake smothered between a rich chocolate Nutella buttercream frosting. You just can’t go wrong with Nutella and dessert! Give our Nutella baklava and Nutella brioche a try! This post may contain affiliate links. Read my disclosure policy here. This recipe was originally posted on Dec 27, 2017, we’ve tweaked it a bit since then. If you are a chocolate lover, then this cake might just become your new favorite dessert. We enjoy Nutella desserts so much that we’ve included a few of our favorite Nutella desserts here. In the bowl of a stand mixer, beat the eggs and sugar on full speed. Then add the vanilla extract and buttermilk. Now mix the instant espresso powder with the water and pour it to the cake batter along with the melted butter. Next, sift the flour, salt, baking soda, baking powder, and dutched cocoa powder into the egg Nutella cake batter. Then gently fold the dry ingredients into eggs using a whisk. Now transfer the chocolate cake batter into 3 prepared 9-inch baking pans and bake for 15-20 minutes at 350 degrees Fahrenheit. Start off by placing the softened cream cheese, unsalted butter, cocoa powder, powdered sugar, Nutella, and salt into the bowl of your stand mixer. Now combine it using the whisk attachment. If you want to thicken the Nutella buttercream, just pop it in the refrigerator for about 30 minutes. Once the chocolate cake has cooled completely, slice the top of each cake using a serrated knife, to ensure a smooth even chocolate cake. Now assemble the Nutella cake by stacking the chocolate cake layers between the rich Nutella buttercream. Always make sure to reserve some of the Nutella buttercream to frost the outside of the chocolate cake. What is dutch process cocoa? Dutch-processed cocoa powder is cocoa that has been processed with an alkalizing agent that gives it a lower acidity. Therefore it results in more rich and dense desserts, with less bitterness and a darker color. Why do you put coffee in chocolate cake? Many chocolate cake recipes call for coffee or espresso in the recipe. This isn’t because coffee tastes great with chocolate (which obviously it does). Its because coffee enhances the richness of the chocolate. This Nutella cake recipe is every Nutella lover's dream cake! 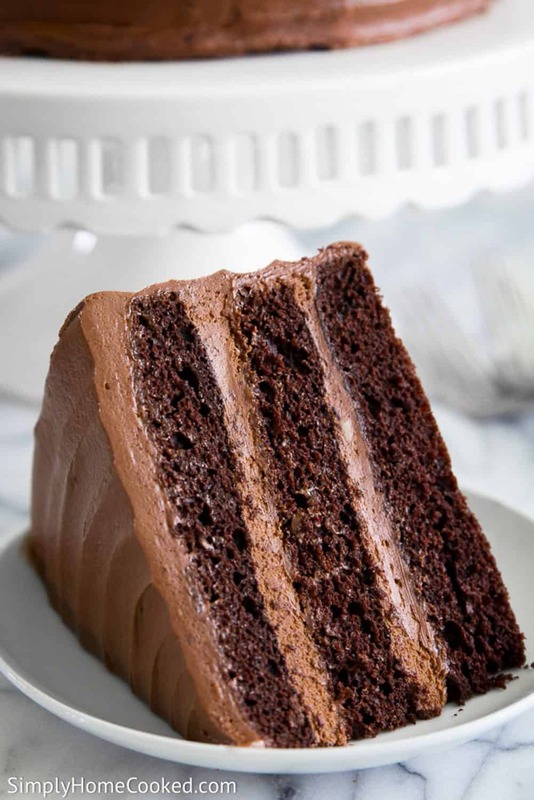 Layers of moist chocolate cake smothered between a rich chocolate Nutella buttercream frosting. Place 5 eggs into the bowl of a stand mixer. Beat the eggs on high speed with the whisk attachment for about 4 minutes. Add 2 cups sugar to the eggs and continue beating on high speed for an additional 4 minutes. Add the 1 tsp vanilla and 1 cup buttermilk to the eggs. Beat again just until incorporated. Dissolve 2 tbsp instant espresso powder with 1 cup room temperature water. Then add it to the cake batter. Then add in the melted butter. Sift, 2 1/2 cups flour, 1 tsp salt, 1 1/2 tsp baking soda, 1 tsp baking powder, and 1 cup dutched cocoa powder into the egg mixture. Then gently fold the dry ingredients into egg mixture using a whisk. Split the cake batter amongst 3 (9 inch) cake pans. Bake at 350 degrees for 15-20 minutes or until a toothpick comes out clean when inserted into the center of the cake. Meanwhile beat 16 oz softened cream cheese, 2 cups softened butter, 1/2 cup cocoa powder, 2 1/2 cup powdered sugar, 1/2 tsp salt, and 2 cups Nutella. Once the cakes are baked flip them onto cooling racks and let them cool completely. 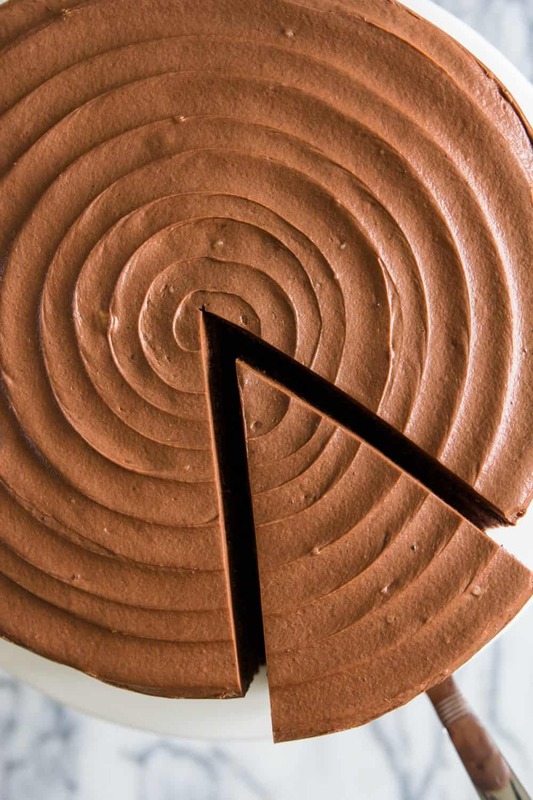 If you want your cake to have a flat top, use a serrated knife to slice the top of each cake. Assemble the cake by frosting the top of each cake layer. Once the last cake layer is placed, Frost the top and sides of the cake. What a beautiful chocolate cake! I love that you added nutella to it. Sounds like a dream! Thank you Kat! It’s my family’s go-to chocolate cake recipe now, especially since we all love Nutella so much! 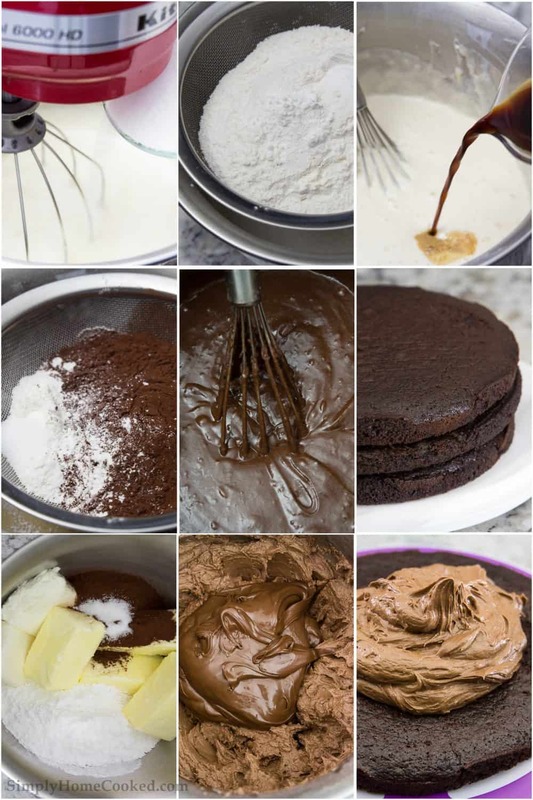 I am bookmarking this nutella cake recipe to make with my daughter. She is just starting to get into baking and your recipe is so well written that even a beginner will succeed with it plus it looks out of this world delicious! Thank you for sharing. Hi Scherrei, my apologies. I have just updated the printable recipe card. I hope your Nutella cake turns out well! Hi , I love this recipe, its a winner every time, i would like to makea smaller one, like 8inch one, help with the measurements please? Thank you, Jazmin! I can’t give you exact measurements without actually trying to cut down the recipe and experimenting with it in an 8-inch pan. It would be a total guess at this point and I would hate to give you guessing measurements. How about using the chantilly cream with chocolate. I did a chocolate cake and I did it like that and the icing was perfect. To stabilize the chantilly cream, you use not flavored mixed with cold water, mixed and let it rest for five minutes, then warmed up, (no boiling just dissolve) mix the whipped cream 33% or more, you can use the Borden brand. Warm it up with chocolate chips in the microwave, mix well ( chocolate will be .melt) put it in your mixer start slow with the paddle, when you see that is starting to build some peaks change the paddle for the whisker and and mix it up in high velocity. I don’t use the borden brand I use the Pastry pride. You can look on YouTube how to make chocolate chantilly cream. My family loves it. Trust me I love you recipe too, but when we have friends coming over some of them don’t like the icing to sweet, he he they don’t know what they are missing. Sorry about my grammar english is my second language. I just wanted to help. Love all your recipes 😋. Merry Christmas to all!! Hi Wanda, thank you for your kind review and feedback! Chantilly cream would be less sweet although I never thought of using this cream here. I make chantilly cream for my berry cake though. I am very happy to hear that you enjoy my recipes! 🙂 Merry Christmas to you as well! I made this about a week ago. It was really good! My only complaint is that the frosting recipe makes an overload of it. I followed the whole recipe to a T.
The cake itself was decadent, moist and overall flavorful. I enjoyed sharing it with my friends and family and then having it with coffee was great too. I had cake for DAYS to give out. Also, have you ever tried adding a crunchy component to the recipe? Like pecans/walnuts? Hello Heather, I’m glad you enjoyed the recipe. Some people prefer more and some people prefer less frosting. Its all personal preference 🙂 I haven’t tried it with nuts before but that sounds delicious. Hey Kate, you can make the frosting a few days in advance. Just be sure to keep it refrigerated in an airtight container. How much is 2 cups of nutella in grams Pls? Hi Sashini, it should be about 592 grams of Nutella in 2 cups. Hi there, cake looks fab, a quick question is the flour you used , plain or Self Raising? Thank you Tracie! I used all purpose flour. Use it for piping and ideas how I can fix it? What is Dutched cocoa and where can I get it? Hi Kim, Dutch processed cocoa powder has a lower acidity which results in a more rich and dense cake, with less bitterness and a darker color. It can be found in almost all grocery stores. Yay! I’m so happy to hear you enjoyed the cake Rachel! I printed out the recipe and after I added everything, I wondered why it called for a 1/2 C butter. It isn’t in the directions, I had to go back to the web page to see what step it was added in. I added it in after everything else, I hope it turned out okay. I had to do a lot of extra mixing so I’m afraid the texture is to tough. I haven’t tasted it yet because it isn’t being eaten until tomorrow for my daughter’s birthday. Can you please add the butter to the directions on the printed version? It’s still not in the printable recipe so my cake is in the oven with no butter. Hi Becky if you are referring to the melted butter in the nutella cake, it IS in the printable recipe. I think you might have missed it. Hi Doris, you can omit the espresso powder but it may change the taste a little. I just had to come here and say again, that this cake looks incredible!! You are so kind Marina! Thank you!! 2 cups of butter? That is equivalent to 4 sticks, right? You only show 2 sticks in your picture and 2 CUPS seems like a lot! It that correct? Thanks! Can’t wait to try this! Hi Krista, I originally made the recipe with 2 sticks of butter but it wasn’t enough. The recipe is for 4 sticks now. If you look at the step by step photos it should have 4 sticks 🙂 I hope you enjoy the recipe! The cake looks heavenly and I want to make it for New Year’s but don’t have espresso powder. Could I substitute cup of coffee instead or what would be your suggestion? Hey Natalie, fill a measuring cup with 2 shots of espresso, then add enough water so the total amount of liquid will equal 1 cup. Regular drip coffee won’t be strong enough. Hope that helps. Hi, I love all your recipes! They all turn out so amazing ! Thank you so much for the website 🙂 I have a question; would it be fine if I didn’t use powered sugar at all? Because it seems like it will be too sweet and I’m not a big fan of too sweet creams. Hi Angie, I am very glad you enjoy my blog and thank you for your kind words! Initially, when I started experimenting with this cake my plan was not to use powdered sugar at all. However, no matter how I adjusted the ingredients and proportions I could not seem to get a thick enough consistency. The frosting was too runny to ice the cake. Therefore, this is why I include some powdered sugar in the recipe. It really helps hold the shape of the frosting. Typically a frosting like this has about 7-10 cups of powdered sugar, I managed to drop it to 2 1/2 cups. There is also a little bit of salt in the frosting, which helps balance some of the sweetness.